Both western medicine and integrative medicine have come so far in fighting cancer, keeping it in remission and even eradicating it. Most cancer survivors also known as “Thrivers” have years and full lives ahead of them after conventional treatments like surgery, chemotherapy or radiation. Research clearly shows that Thrivers have unique nutritional needs. Meeting these needs is a key step in helping them to quickly regain health and vitality, and to prevent recurrences. Thrivers, are typically extremely motivated to take care of their health, feel well and live as well as possible. They often focus on natural approaches like a healthy lifestyle, food and nutritional needs. In addition to building a foundation for good health, Thrivers’ want to ameliorate lingering side-effects of conventional therapies/toxicities and to prevent any cancer recurrence. Common after-effects of the cancer treatments — fatigue, memory problems (“chemo brain”), and insomnia — are quality of life issues. Tackling these is a keystone of feeling better. Life is better for anyone and everyone when we are rested, have more energy, and can think more clearly. Many Thrivers view their survivorship as a new beginning. Recently I had the fortunate opportunity to hear Dr. Lise Alschuler, an expert in Thriver care and Thriver herself, present the comprehensive research behind a new line of professional nutrition supplements that she designed for Thrivers. The research was thorough and compelling. The products are scientifically formulated and designed to be easy to incorporate. The product suite begins with foundational products of Multivitamins (with Multiminerals) and Flavonoids. ProThrivers Wellness Multivitamin is a combination of key nutrients that safely support the overall health and energy metabolism of Thrivers. A unique aspect of this formula is what it does not contain – beta-carotene, alpha-tocopherol, copper or boron. Data data indicates that these nutrients may be contraindicated for some Thrivers. ProThrivers Wellness Flavonoid Complex features a unique synergistic combination of herbs and nutrients intended to support antioxidation. Prothrivers also includes complementary products that target symptoms that commonly linger after active cancer treatment. Individuals can use some or all of these targeted products, depending on their personal needs. 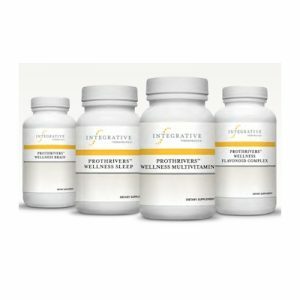 Prothrivers Wellness Brain is intended to support cognitive clarity and brain health, with a unique combination of ingredients and nutrients. Prothrivers Wellness Sleep contains ingredients that are especially beneficial for sleep. Not only do we all feel better after a good night’s sleep, but having healthy sleep is a critical way that all bodies heal. It is especially essential for Thrivers. 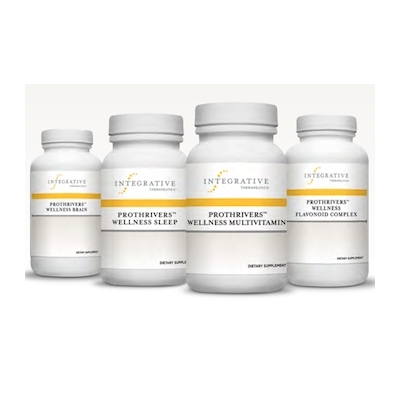 I’m very impressed with the scientific basis for the ProThrivers line as well as their quality. I am excited to offer these professional grade supplements in my online shop. With the addition of probiotics, fish oil and Vitamin D3, a comprehensive foundational program for Thrivers can be achieved.